How come the Fury X does so well at higher resolutions then? Well, thing is that killing all cards with 4GB VRAM is easy as long as you forbid games from using lower texture LOD. But on 1080p, there is point from which higher texture resolution makes no difference. And that is before 4GB cards start to suffer. Therefore 4GB cards will continue to do just fine. 4gb cards are fine but why is nvidia still trying to push 3gb variants is beyond me. Even at 1080p you will be vram limited. 4gb cards are a bad investment. You pray to developers to not use lots of textures. To all of you above just check that here. 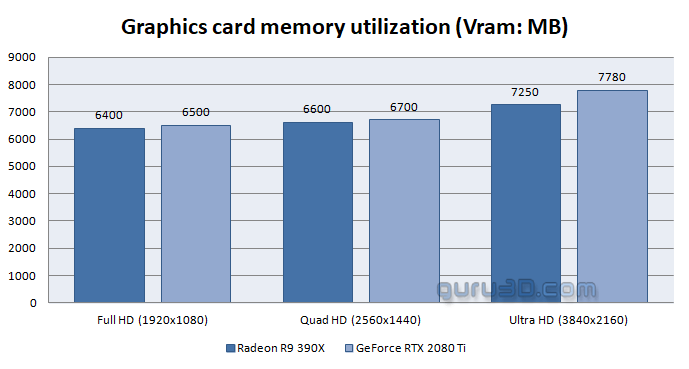 590 rx is the ultimate mid-range gpu at the moment, it has proper power to utilize more than 4gb vram. Shadow of War uses great amount of Vram 'till today. Learn from it. It clearly shows for example FuryX is weaker in comparison to smaller 590. This is a bit of a loaded answer. The only time you're going to see a major difference is when individual textures, or even multiple immediately required textures for a single frame, are going to overload the frame buffer to an extent that it becomes impossible to get by with less memory. That's simply not going to happen, so increasing LOD quality and even anisotropic rates may be of some value, but it will just look all out of place unless all the textures are matching in quality, and at that point, the issue is going to be the GPU's capabilities and the memory bandwidth to move that data. Simply put, and yes, we've heard this a million times before, no point in sticking 8 GB on a lower end card, as it'll make no difference. Sames goes for bandwidth, which is the Achilles heel of the RX 4/5 series. So, to answer my own question, it's because the Fury X is capable of processing data faster due to a higher spec GPU and HBM memory. SOTTR is also a good comparison how even a 6gb is easily used. I would think twice before buying a 399$ 2060 6gb if you plan to keep the gpu 2 or more years. Allocated does not equal needed. Still if you dont have enough vram game will try to compensate by using more system memory. That cant be a good thing, right? Not if it doesn't need it. It clearly shows for example FuryX is weaker in comparison to smaller 590. It clearly shows how much drivers have improved in the last year or so. As of actual situation of that SotTR. 1080p/1440p/2160p benchmarks have RX470(4G), RX570(8G) + Fury X(4G), RX580(8G) to compare. On all mentioned resolutions RX570 is ahead by 8/10/13% from RX 470, but that difference falls within rounding error as fps on 1440p is not exactly OK, and 2160p performance is far from playable. For RX580 and Fury X, RX580 is ahead by 5/-3/0% and again that's within rounding error for given fps. So, it is great example showing that all those allocated gigabytes are actually not needed to render each frame.